Frank Laureano had a singular goal in 1987, playing for the single-A Appleton Foxes, The Appleton Post-Crescent wrote that July. And he was doing his best to reach that goal, The Post-Crescent wrote, hitting .319 and knocking in 60 by late that month. "I want to make the big leagues," Laureano told The Post-Crescent. "That's all I want to do." 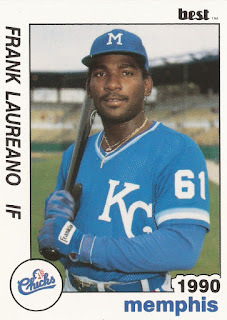 Laureano, eventually seen by one account as "the heir to Royals second baseman Frank White," went on to play in six affiliated seasons. But he never fulfilled his goal, or that promise. He made it to AAA, but no higher. Laureano's career began with the Royals in 1985, signed as an undrafted teenager out of his native Dominican Republic. By 1986, the then 18-year-old was playing stateside, for single-A Burlington. There, he hit .275 in 130 games, also hitting seven home runs and knocking in 37. He moved to the Royals' full single-A team in Appleton for 1987, hitting .323 there, with 16 home runs and 87 RBIs. He also stole 19 bases. After a year at single-A Virginia and Baseball City in 1988, where he hit just .222 between them, Laureano played at Baseball City full time in 1989. He also made the Florida State League All-Star team. On the year in 1989, Laureano hit .260, with 66 RBIs and swiped 25 bases. In late-May, Laureano knocked a two-run double. In June, it was The Newport News Daily Press that compared Laureano to White. Laureano then was hitting .263, with 22 RBIs. Laureano moved to AA Memphis for 1990, his average dipping to .241 on the year. He also knocked in just 36 in 108 games. He played 1991 mostly back at Memphis, but he did get six-games at AAA Omaha. In those six games, he went 3 for 19. They were also his only games at AAA, his his career ending without making the bigs.